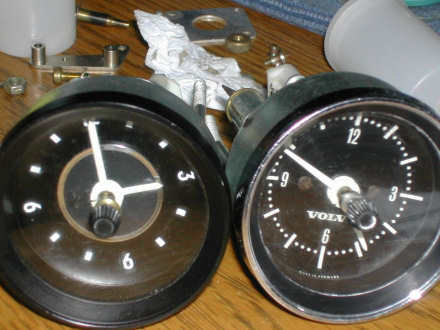 Although more reliable than the early Smiths clocks used on the '61 - '69 1800 models, the VDO clocks Volvo used in '72 and '73 1800s and early '70s 140 series cars (also early '70s Porsches, Mercedes, BMWs, Audis and SAABs) still have a tendency to fail fairly often. 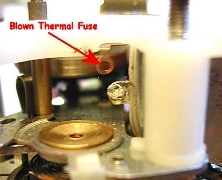 This often happens because something has caused a thermal fuse inside the clock to blow. 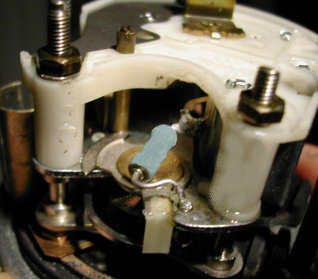 Once this happens the fuse has to be resoldered using very special low temperature solder. To function properly, the solder used on the thermal fuse must have a melting temperature that's a little more than 60 degrees Celcius (~115 F) lower than regular 63/37 Sn/Pb solder. There are webpages out there on the Internet that tell you how to do a quick and dirty repair job on the thermal fuse using regular solder. That solution is, however, not adviseable as it will cause your clock to fry and suffer irrepairable damage if whatever happened to cause the clock's thermal fuse to blow the first time were to ever happen again. And therein lies the rub: If it happened once, what's to stop it from happening again ? Well, not much. And if does happen again you can kiss that clock good-bye if you took the easy way and fixed your thermal fuse with regular solder. Sniff, sniff... Hey, do you smell something burning ? The only safe solution is to re-solder that thermal fuse back together with the same sort of low-temp solder that was used in the factory. If only it were so easy. It turns out that it's virtually impossible to get solder with a melting temperature low enough to replace what was used in the factory. We searched high and low for some of this solder and all we could come up with was a very special Indium alloy solder that costs (get ready for it) OVER $350 USD PER FOOT!! Hai carumba !!! That's nowhere near practical so we at Volvosolutions.com came up with our own very unique and pragmatic solution. We managed to find a special (and affordable) solder with a pretty low melting temperature. But it still wasn't quite as low as it needed to be to match the specs of the original thermal fuse solder so we still needed something else to compensate for the differences in order to ensure the thermal fuse will blow before the amount of electrical current going through the clock exceeds the design maximum. So we came up with a way to split off some of the current on the downstream side of the thermal fuse by running it straight to ground through a resistor. By sizing the resistor properly we could then make sure that the thermal fuse would still blow when the current going through the clock neared it's design maximum thereby fully compensating for the difference in thermal fuse melting temps. That's a pretty ingenious little solution, even if we do say so ourselves. Note: Sometimes these clocks fail due to excessive wear/play in the pendulum bearings/jewels or for other reasons. These clocks were intended to be disposable and were never designed to be taken apart and worked on. It's therefore not always possible to repair these clocks even if good spare parts are available from a donor clock. In cases where the clock cannot be repaired we will only charge you $20 for cleaning and attempting to get the clock running and will return the clock to you if you also pay the return shipping cost.